Author Written by Velmurugan Saravanavelu and last updated on Posted on June 5, 2017 . 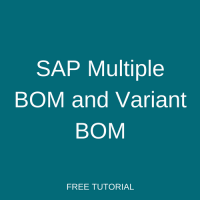 Welcome to the tutorial about SAP Multiple BOM and Variant BOM. This tutorial is part of our SAP PP course. In this tutorial, we are going to learn about two specific types of bills of materials in SAP: multiple and variant BOMs. We will provide business examples that explain when these types of BOMs are necessary and their unique features. SAP multiple BOM (Bill of Materials) is also known as alternative BOM and denoted as BOM type “M” in SAP ERP. When an assembly or subassembly can be made using different sets of components or different combination of raw materials, it will have more than one BOM which is known as multiple BOM. BOM group for all these alternative BOM will be same. Consider the chemical manufacturing industry which manufactures “Ethyl Acetate”. There are two production methodologies used to produce Ethyl Acetate. Esterification of ethanol with acetic acid. Catalytic condensation of acetaldehyde with alkoxides. In this example, we have to create TWO bills of materials for Ethyl Acetate. Raw materials: Ethanol and Acetic Acid. Raw materials: Acetaldehyde and Alkoxide. When we create BOM for the same assembly more than one time, SAP ERP system automatically sets BOM technical type as “M” (Multiple BOM). We can also have a business case where two bills of materials are created for the same assembly because one is for production purposes and another one is for engineering design purposes. In this case, usage of BOM will be different, but still the SAP system considers this as an alternative BOM. When we create a production order, a production person will select the suitable alternative BOM to be used for the production. Now, imagine that the design department wants to use different spark plug components from next year onwards in order to improve the engine performance. In this case, an additional alternative BOM will be created with validity date starts from 1 January 2018 to 31.12.9999 and the first alternative BOM will be marked for deletion or locked for production usage after the 1st of January 2018. So that SAP ERP system will plan and consume the new spark plug for the production orders created after the 1st of January 2018. Several similar materials which have common parts can be created as SAP variant BOM. SAP variant BOM will have BOM technical type “V”. BOM group for all these variant bills of materials will be the same. This helps business users to simplify the BOM maintenance. Consider an example from the food industry. A company manufactures different chocolates with flavor of milk, coffee and cocoa butter. Initially BOM is created for milk chocolates. When BOMs for coco chocolates and coffee chocolates are created, they will be created as variants of milk chocolates. The SAP system automatically assigns technical type “V’ for these BOMs. Both multiple and variant BOMs are created using the transaction CS01. You can read more about creation of SAP bill of materials in this tutorial. When BOM is created for an assembly which already has BOM, the SAP system automatically adds an additional alternative and creates multiple or alternative BOM.